SRINAGAR, OCTOBER 15: Secretary Information Technology (IT), Saugat Biswas met Governor Satya Pal Malik at Raj Bhavan today. During the meeting, Sh. 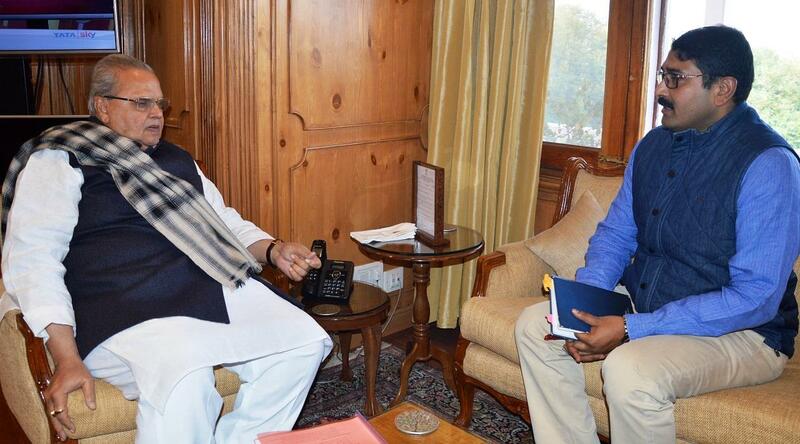 Biswas briefed the Governor about the pace of work on digitization of records of all departments. Governor also took note of the on-ground progress made in development of e-infrastructure to facilitate quick delivery of services to the people. The Governor urged on the need to promote; e-Governance for empowering citizens, the inclusive and sustainable growth of the IT for enhancing efficiency, adopting a multipronged strategy that includes development of human resources, promoting R&D and innovation. Governor stressed that digitization of all relevant records should be completed within set timeframe, so that all essential services could be made easily available to the people of the State.